Add a bit of joy to the winter season with this easy winter growing kit for the Paperwhite flower, a pretty bunch of blossoms with white petals and delicate scent. The indoor growing time takes approximately four to six weeks, and your recipient can enjoy lovely Paperwhite blossoms during the two to three week bloom time. Paperwhite Growing Kit with Complete Instructions. Living Bulbs, Pumice Stone for Draining. Winter Paperwhites Kit is a hand delivered gift. These gifts are delivered by one of our local design centers located throughout the United States and Canada. Same day delivery is available for most gifts when ordered before the cutoff time. The cutoff time for Winter Paperwhites Kit is in the recipient's time zone. 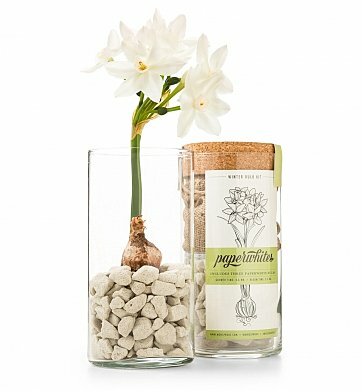 This festive kit holds everything needed to grow and bloom Paperwhite flowers indoors. Was very pleased again with my purchase and the exceptional service with your customer service person Megan . I'll come back again for my gifts.